The Big Dreams Beach Hotel was my first Lilly Bartlett read and oh my, what an absolute pleasure. Rosie is working at a hotel in Scarborough, an unusual one to say the least and one that time forgot. She’s the manager and it’s not exactly making loads of money. There’s an unusual cast of characters who are residents at the hotel (this made me think of Fawlty Towers!). The Colonel, Lill, Miracle and not to mention Peter and Barry (his Basset Hound). They’re all such brilliant creations, unique and interesting people who I really cared about. But when the Colonel decides to sell the hotel along comes Rory, transition manager, and also rather good looking. He and Rosie have to work together. Perhaps you can see where this might be heading….. This story and these characters could be rather twee in the wrong hands but Lilly Bartlett has wonderful storytelling ability and instead it’s a really heart-warming, lovely read. 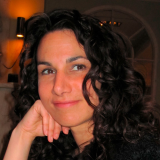 I warmed to the characters instantly and I really wanted everything to work out for them. There’s a lot of humour in the story, both within the dialogue and in the behaviour of the characters. There’s plenty of sarcasm and it may be the lowest form of wit but I happen to find it very funny. I loved the fact that it is set mostly in Scarborough. It’s somewhere that I went on holiday quite a few times so I am fond of the place. The hotel is quite old-fashioned but the so called improvements wreaked on it by the bizarre new owners are quite something. I’ll just say ‘flamingos’ and leave it there! This is feel-good fiction at its best. I enjoyed every minute that I spent reading it and gave a sigh of satisfaction when I got to the end. I’d say it’s the perfect light read. With thanks to Michele Gorman for the review copy. 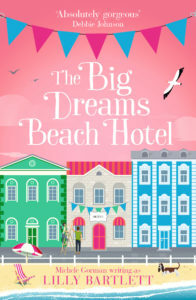 The Big Dreams Beach Hotel is available now in ebook (only 99p at the moment) and paperback.